Two lost souls. Both running from their past. No Escape from a Killer, book 4 of the A Men of the Badge series. Emmy is on the run from her supposedly dead Atlanta cop husband which she is a suspect in his murder. She believes he’s still alive and stalking her. Luke is on personal leave from the Atlanta police department after the death of his wife. Emmy & Luke both end up in the small mountain town of Hawk’s Peak. By the time Luke figures out why Emmy looks so familiar, she’s already made his life worth living again. He works to gain her trust, and to figure out if she really killed her husband. The Emmy he knows couldn’t hurt anyone. Was she really Emily, the woman so many cops want to find and who they believed killed her husband? Luke enters Emmy’s life just when she had almost lost faith in the future, the possibility that she could ever have a normal life again. When the stalker continues to close in on her, anger takes over her fear. She’s determined to stand her ground and not run anymore. Emmy and Luke set out to work together to trap her stalker. Luke was first introduced in Tempted to Kill. So glad he has his book since I was drawn to him in that book. There are twists, romance, mystery, and suspense. 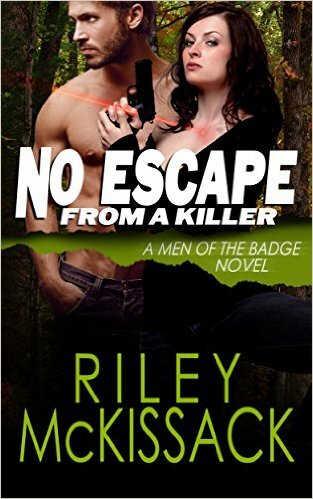 No Escape from a Killer is a great addition to the Men of the Badge series. I am anxious to continue the series as more books are released.